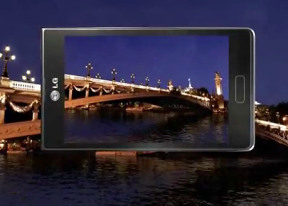 We said the UI is pretty, but how well does the Optimus L7 perform? To find out, we did what we usually do - put it through the BenchmarkPi, Linpack, NenaMark performance tests, as well as the SunSpider and BrowserMark browser tests. The 1 GHz processor on the Optimus L7 definitely showed its age, and the fact that it's single-core didn't help much either. In the first test, Benchmark Pi, we see how fast the CPU is able to compute. The single core CPU is definitely not up to par with the other (admittedly more expensive) devices we have recently tested. Linkpack is another processing test, so we weren't too hopeful for the L7 here either. The only device that it came close to was the single-core HTC One V, which still was 10 points ahead. BrowserMark adds HTML5, but doesn't help the Optimus L7 case a great deal. It manages to beat the One V, but the rest (even the Android 2.3 smartphones) are out of reach here. NenaMark 2 is where the GPU gets to show its worth. The Adreno 200 graphics processor was simply unable to keep up with the big dogs. It rounded out last place with an average FPS of 19.3 (though keep in mind that the One V isn't present here). In today's market, we'd be hard-pressed to recommend this phone, if we only went by its hardware specs. That being said, there aren't too many more powerful options in its price range. Sure, the Samsung Ace 2 and the Xperia U will give you an extra core for the same price, but don't forget that there's the 4.3" screen and updated OS to consider. Up next is our look at the phonebook and messaging capabilities of the L7.